Why it matters: With SSD prices going down and overcapacity on the horizon, Samsung is pulling all the stops and announcing a top-to-bottom line-up of new SSD devices and technologies. Samsung has held its Tech Day event in San Jose this week, and spilled the beans on its plans to bring to market a number of new SSDs, microcontrollers and brand new NAND flash packaging technology, with the company transitioning into its fifth-generation 96-layer stacking 3D V-NAND. 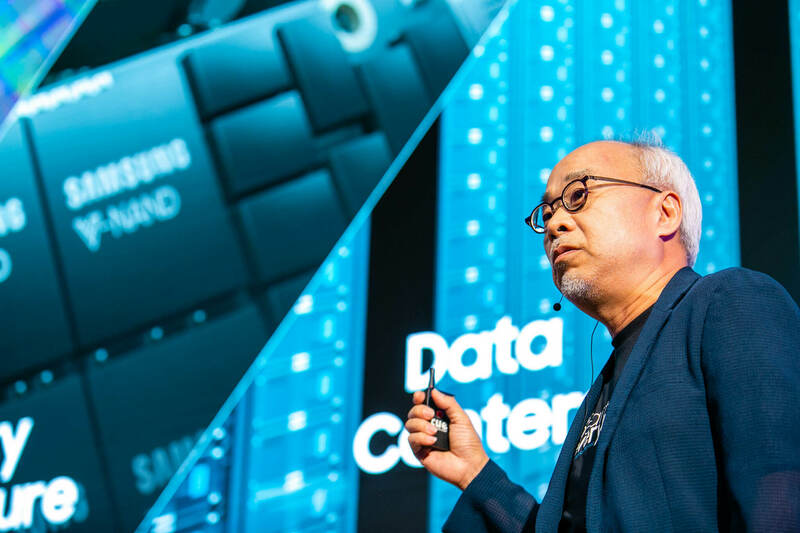 After starting commercial production of Quad Level Cell-based (QLC) NAND flash memory this July, Samsung has now announced new iterations for product families across existing line-ups, top-to-botoom, and even a new naming for SSDs based on QLC. According to Anandtech, the current line-up of Samsung SSD-based products will receive the higher-stacked flash cells, but remain as tri level cell-based (TLC) 3D V-NAND products. The PM981 NVMe SSD becomes the PM981a, with some serious random I/O improvements, but despite the higher-density NAND, capacities will remain the same (suggesting some savings we hope will be passed on to the consumer). The 970 EVO SSD will spawn the EVO Plus. In the datacenter, Samsung will be introducing the updated PM983a (in lieu of PM983). However, here, we'll see Samsung opening up the tap on capacities and effectively doubling them. For QLC-based products, Samsung will introduce the "BM" prefix (SMxxx were MLC NAND, PMxxx were for TLC NAND-based kit). So the first QLC products will be the BM1733 and BM9A3 enterprise NVMe SSDs, the BM1653 SAS SSD, and finally the BM991 NVMe SSD. Samsung will also be launch 860 and 980 QVO-series SATA SSDs, which Anandtech believes to be OEM material, although we don't see anything wrong with the naming, which emphasizes quad-level cell DNA. Apart from this, Samsung's Z-SSD low-latency SSDs will also get a refresh in the form of the SZ1733 and SZ1735 NVMe SSDs. Z-NAND units will not yet benefit from QLC flash, but Samsung did manage to demo a 4TB unit without, presumably using MLC flash. First gen Z-SSD used only SLC flash to achieve their low latency. Z-SSD will also cater to the upcoming PCIe 4.0 interface with its 12 GB/s sequential read (although the biggest performance enhancement is in terms or random, rather than sequential). Down the line Samsung will breakout an MLC-based Z-SSD device whose name remains a mystery.